I was a little bit not sure when someone ask me "how to make minions from Despicable Me 3 movie? oo...let me think I said. I am asking myself how to make minions with prison jumper in easy way so parents/ teacher can share the technique . I look around my drawer and aha...I saw my clay extruder. I thought, well that would be helpful. Indeed, it helps me to make black and white stripes. The rest, as you see in my Kevin, 2015 minion is not that hard. 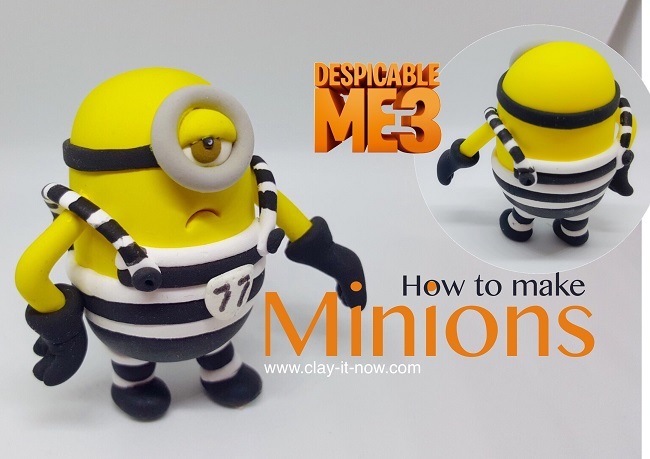 How to make minions with prison jumper in easy way? First of all, let's decide what clay you want to use. 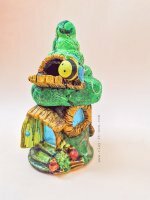 Well, I play a lot with homemade clay recently but I have decided to use store-bought air dry polymer clay this time like those time when I started playing with clay. Let's start making a ball shape which then you can change it to cylinder shape with length approximately 5 cm (or about 2 inches). Then, use your smiling clay tool or drinking straw to make unhappy mouth (inward curve line) . Start with a small ball shape in black colour, flatten it with rolling pin or flat bottom glass as I did because I realized that it would be easier to make round flat clay with round glass than rolling pin :). Paste black flat round surface to the bottom part of yellow cylinder and smooth it out. Then make spaghetti shape with clay extruder. If you don't have clay extruder, roll the clay with fingers on flat surface to make spaghetti shapes. Start with white spaghetti, wrap it around minion's body on top of black round base that you have done it previously. And continue by alternating the color between black and white. Add the straps and then paint white straps with black water color paints. I add cling wrap to protect the body from black paints. Btw, don't forget to make half flat round white clay where you can add the prison number on it. The next step is to make the legs and shoes. I make two white small cylinder shape and 1 black. Place the black one in between the 2 white and roll it. Then tapered the top part where you can then paste it to the bottom part of minion's body. Do the same things for the other leg. For goggle, start with light grey small ball shape, flatten it and then make round hole in the middle with drinking straw. As for the eye, start with small white ball shape flatten it, add dark brown flat round clay on top of it, add small black dot. Then, make half flat round yellow clay for eyelid. 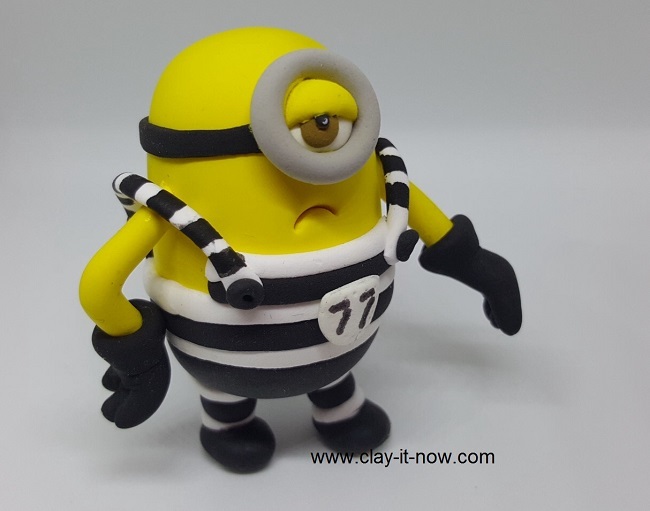 You can make more minions with different prison number, add the hair, change thier hands position or make 2 eyes minions. 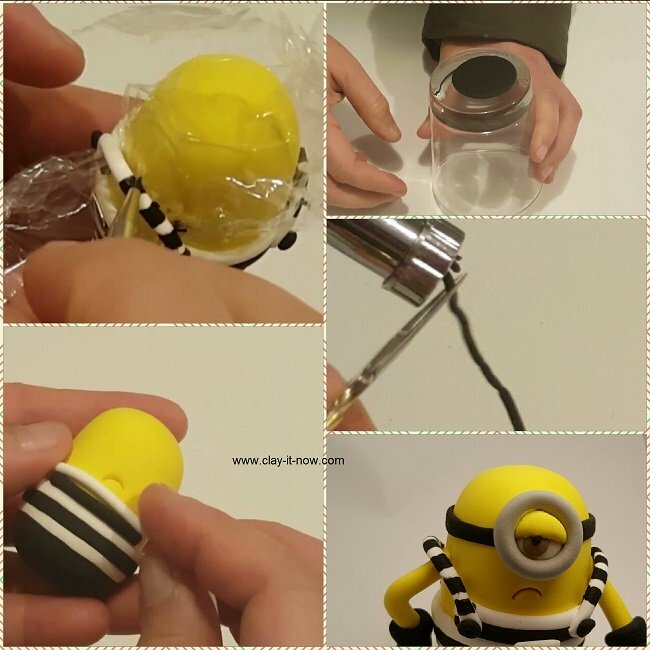 I am sharing my steps in video tutorial on how to make minions at my youtube channel. Please share and subscribe if you like it.